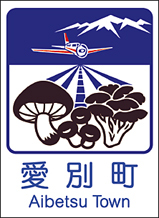 Aibetsu-cho is located on Route 39 and is recognized as the biggest mushroom producer in Hokkaido. 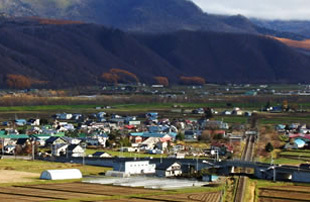 Aibetsu is a great place to enjoy nature with access to a sports park where you can enjoy many water-related activities, have an outdoor BBQ, or take part in agricultural activities. There are several high quality park golf courses as well as a perfectly maintained auto-camping area. For lovers of golf, the Asahikawa International Country Club is just around the corner and provides a luxurious golfing experience at very reasonable prices. miso soup, while Enoki is the all-rounder of mushrooms. Mushroom miso soup is prepared in a giant 3.5m wide pot. Mushroom curry, soba noodle, and bread all have mushrooms in them. Pay ¥2,000 for the "All you can eat" mushroom and beef bbq featuring the freshest mushrooms of the season in all varieties as well as succulent beef strips that you cook yourself on one of the many huge communal barbeques. Kyowa Onsen Inn offers a full course mushroom dinner on reservation. Locally grown shiitake, maitake, and other delicious mushrooms are served in sashimi-style, tempura, soup, casserole, and other dishes. Its onsen (hot spring) water is cold carbonated water and is great for drinking. In Ainu, "ay-pe" means sharp object or spike. "Aibetsu" describes the shape of the flow of the Aibetsu river, like an arrow. 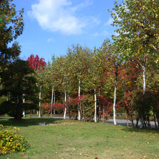 AICC is a beautiful and well maintained golf course in the Aibetsu hills. It is considered the most elegant and popular golf course close to Asahikawa.